Injuries that a car accident victim sustains can range from minor to severe and life altering. Some of the most debilitating injuries are those that relate to the spinal cord, as this is one area of the body that does not heal itself like a broken bone or torn ligament might. Spinal Cord Injury (SCI) causes permanent damage to the nerves in the spine, resulting in permanent damage, loss in sensation, strength, and related body functions that happen below the site of the injury. Car accident SCI is not difficult to sustain because of the amount of force that is applied to the body from any given direction. The Centers for Disease Control and Prevention (CDC) reports that there are about 200,000 people in the United States living with SCI, and that 46% of the instances of SCI that exist are related to automobile accidents; the average cost of medical treatment is $15,000 — $30,000 annually. The litigators of the Tapella & Eberspacher Law Firm understand how difficult it can be to live within the limitations that SCI places on its victims, and that the negligent party that caused your pain should be brought to justice. If you or someone you love suffered spinal cord injury because of another driver’s irresponsibility, you may be eligible for compensation based on the pain and suffering you experienced. We will always fight for the MAXIMUM amount of compensation due to our clients, and our skilled legal team will represent you with compassion and competence. To find out how we can help, simply fill out the “Free Case Evaluation” form located on the right, upper side of this page. It is 100% FREE and there is no obligation to proceed. The details of your case will always remain confidential. The National Spinal Cord Injury Statistical Center (NSCISC) reports that 36.5% of SCI cases were caused by motor vehicle accidents since 2010. The 31 delicate vertebrae that span the length of nerves inside the spinal column help to protect them and act as a shield from outside trauma. When trauma occurs to the nerves at the base of the spinal column, serious injury can result. Spinal cord injuries can occur in a traumatic or non-traumatic manner. Auto accidents are traumatic events that usually cause a sudden blow to the spine, the force of which penetrates, crushes or compresses the vertebrae and damages the nerves inside. 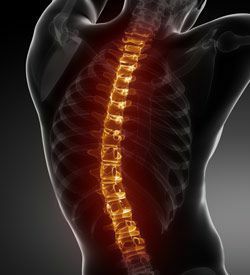 Sadly, once the nerves inside the spinal column are damaged there is no way to repair them, which is why SCI can be such a traumatic event for car accident victims who experienced permanent disability because of it. Though many cases of SCI result in permanent paralysis, this is not always the outcome. SCI can be classified as either complete or incomplete, and in some cases a victim may experience some sensation or some ability to control their body below the site of injury. As incomplete SCI goes, Central Cord Syndrome (CCS) is the most commonly occurring type of SCI, and according to the Journal of Spinal Cord Medicine it affects 9% of all SCI patients, while quadriplegia or paraplegia are the result of complete SCI. The legal team of Tapella & Eberspacher understands that auto accidents can cause damage beyond the victims’ physical suffering, and that reckless and negligent behavior will continue on St. Louis roadways until the responsible parties understand that their actions caused your pain and suffering. We are proud to represent the victims of auto accident spinal cord injury and to protect their rights during trying times. Our attorneys have the passion and knowledge to competently represent you or your loved one in court, and we want to help you fight for the MAXIMUM compensation for your auto accident. …and most other surrounding areas. To learn more about our law firm, or to schedule your free no-obligation case review, our attorneys welcome you to contact us at (855) 522-5291 where a member of our intake team will gather information regarding your auto accident case and quickly connect you with one of our caring attorneys. Begin here by filling out the “Free Case Evaluation” form on this page – It’s that easy and completely confidential.